I would love to visit your school! For the past 30 years, I've written quirky -- even FUN -- nonfiction for young readers; magazine articles first, then children's books. About ten years ago, I added school visits and festivals to my professional portfolio. WONDERS OF WEIRD is for upper elementary and middle school students. I use weird, odd or surprising information I've unearthed through my work to teach both research skills and the importance of critical thinking. Now, more than ever, kids need to know how to evaluate information and look for more. I try to make that quest fun. I tell my true stories and share related images through Powerpoint presentations. 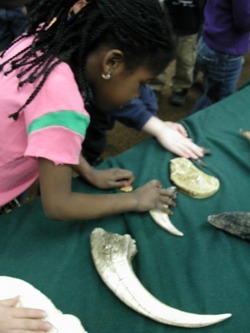 I also share fun artifacts including Bigfoot track casts, masks, fossils and other physical elements. For younger elementary students, I offer DINOSAURS, a fun lesson in comparative zoology, complete with a collection of dinosaur claw replicas and coprolites -- also known as dinosaur poop. I can do age appropriate fiction writing workshops, if requested -- My Pet Dinosaur for k-1st, Bigfoot for Breakfast of 2nd-6th and Mission Mummy for 7th-8th. But teachers are far more skilled at the task than a hard working nonfiction author. I defer to the talents of educators every time when it comes to fiction. The increased cost of living has forced me to raise my daily rate to $1000 plus travel expenses for a full day of presentations -- up to six in a single day. But if that's beyond your budget, let me know what you can afford and I'll do my best to say yes. No school should miss the magic of an author visit due to financial limitations. And the kids are what matter to me most. So please, let's make it happen! If you choose to book a day of presentations, please know how much I appreciate it. Children's writers are a happy crew, but they live in financial uncertainty more often than not. Your decision to host an author (me) can make the difference between making the monthly bills and not making the monthly bills. Wondering what other schools think about my author visit skills? Check out a few of their comments here: references. I can also put you in touch with a few librarians, upon request, if that's better for you. There are bad author visitors out there, and your investment matters. I'm happy to help you feel good about picking me. I ask you to cover my flight, hotel and ground transportation if a volunteer driver isn't available (for rides to and from the airport and rides to and from school). But remember, if you decide to invite me, you can reduce the flight expense significantly by asking other schools to book visits the same week I'm in town for you. If my flight costs $550 and five schools share the cost, that's only $110 per school. I don't require a "fancy" hotel. Any decent chain in a safe location near the schools will do. Imagine the hotel you'd book for your mother-in-law and you're probably in good shape (unless you don't like your mother-in-law). I do ask for a hotel with a free hot breakfast. Scrambled eggs make for the best school visit fuel. I can rent a car and invoice each school for a percentage, but I prefer volunteer drivers so there is no chance I'll get lost or be late. Plus it saves you a little money. I do not invoice you for my meals. I eat at home and pay for it. I can pay for it when I'm away from home, too. I don't require advance preparation, but it can make for a better event. So I offer a few things to help. I have professionally crafted Bigfoot, alien and dinosaur coloring mask files I can email you (check them out HERE). 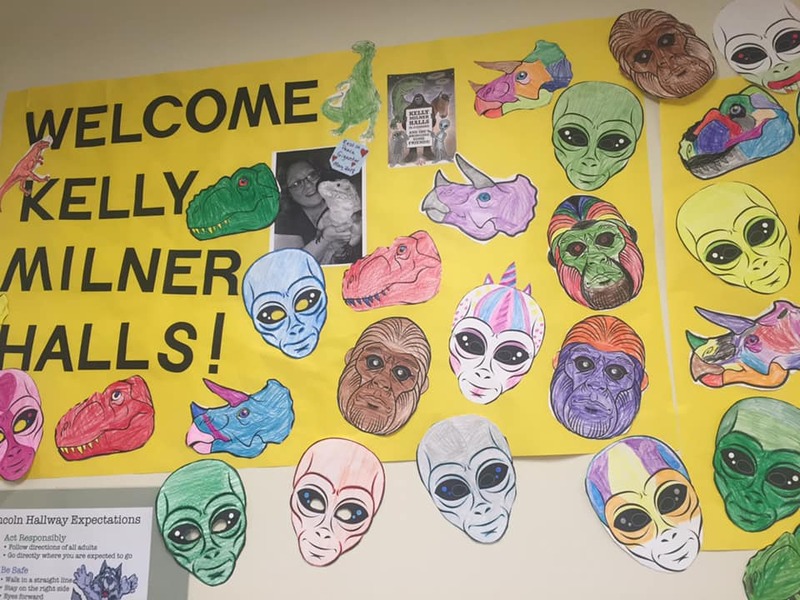 Some schools use the finished masks to create bulletin boards. I also have a ten episode video series I created for Microsoft called KELLY'S CURIOSITIES. Each one is two minutes long -- short enough to share without scrapping your library lesson for the day. It helps the kids to understand who's headed their way. Dismissal and back to the hotel or airport. Note, we can walk from classroom to classroom if time permits to allow for Q&A after the presentations. You are not required to sell books in advance of my author visits, but it's always nice. Your local bookseller is your easiest option. They can create a flyer of available book titles for parents to consider. Pass it out a month before I arrive, get the orders and money back to the bookstore and have them waiting for me to sign when I arrive. Another choice is to order books directly from my publishers for a deep discount. You or your PTO president can prepare a flyer, collect the money and fill the orders before I arrive. Once again, I'm happy to sign them once I do. After the visit is over, you return the books you don't sell to the publishers and pay for the books you did sell with the money you've collected. You can either pass the discount on to your students, or you can use the profit to offset the cost of the author visit. If you need a sample book sale flyer, I can share one. Just let me know. Did I miss something? Don't hesitate to ask me any questions you might have. I'll do my best to help. Here's hoping we can share an author visit soon! Thanks for even considering it. Wondering what my presentations are like? Check this out! Much appreciation to Fife Free Press reporter Matt Nagle for this amazing article about my school visit in December of 2010. To read the full text, click HERE. And click HERE for "ten tips for a perfect school visit." Great Blog.